Research: Trading Ethics for a Design? Could a Democrat work for a Republican? Could the Yankees support the Red Sox? Could you work for a client in a campaign you don’t believe in? The latter does come up in design. Certain design jobs do affect a person’s set of ethics. I believe in how the fashion industry is twisting reality and contributing to eating disorders in many young women, but if I was approached by a fashion model to launch a portfolio site, I don’t think I’d have many sleepless nights. Is that just me being hypocritical? I say no. Design is a passion, but also a job that people use to make a living. Unfortunately, I am not in the position to be overly selective in which jobs I accept. Like Michael Rock, Susan S. Szenasy talks also about designers becoming socially responsible or “citizen designers.” I find that a lot of the people talking about being a “citizen designer” are rich with experience and have the time/finances to do so. Has some design moved away from the arts and toward commercialization? Of course it has. I do not shy away from that, as I was an Advertising and Promotions major as an undergrad student. I would, one day, like to be apart a greater social cause, in time and experience. David Airey mentions working with non-profit agencies on cause you do support to counterbalance the job you may not fully support. I have worked full time at a non-profit agency and several agencies with freelance projects. Ennis Carter founded the organization, Design for Social Impact, specifically to address the design needs of non-profit and community based organizations. As Carter explains, “We strive for a fair and just society in the best way we know how – through beauty, story and service to the community.” The pay on this level can be little to non-existent, but the levels of appreciation my non-profit clients have shown me is tremendous. I’m sure a young George Clooney’s ideal acting choice was not the guest spot on The Facts of Life. Some call taking a job you don’t believe in unethical or “selling out” for the sake of a dollar. When I have the resources to make a difference, feel free to call me that. In the meantime, income aside, I see it as way to build experience. I look at these jobs as a true challenge, so when a project comes along that I truly feel passionate about, I will be more than prepared. If you toil enough at your craft, sooner or later you will be able have that artistic freedom and make your own rules. Fisher, Jeff. “11.” The Savvy Designer’s Guide to Success: Ideas and Tactics for a Killer Career. Cincinnati, Ohio: How Design, 2005. 171-72. Print. Shaughnessy, Adrian. “7.” How to Be a Graphic Designer without Losing Your Soul. New York: Princeton Architectural, 2005. 104-05. Print. Heller, H. J. ., Bolesław Bierut, and William Drenttel. Looking Closer Critical Writings on Graphic Design. New York: Allworth, 2007. Print. “Ethics and Sustainability: Graphic Designers’ Role.” AIGA | the Power of Design. Web. 06 July 2010. <http://powerofdesign.aiga.org/content.cfm/szenasy>. “Responsible Design? (1/2).” Sketchblog. Web. 07 July 2010. <http://sketchblog.guava.nl/2007/05/01/responsible-design/>. 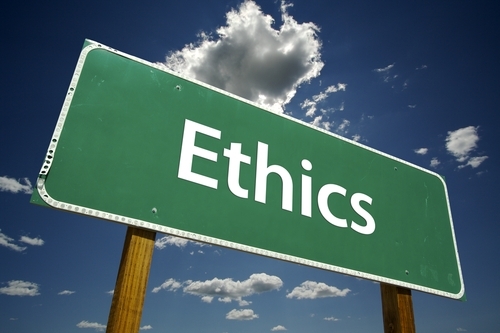 “How Ethical Are Your Design Practices?” David Airey, Graphic Designer. Web. 06 July 2010. <http://www.davidairey.com/how-ethical-are-your-design-practices/>. This piece once again is written well. I understand and agree with the plight of moral choices in job selection. I think everyone has this conflict at one point or another in both their jobs and life. I can tell you now that everyone “sells out” at some point or another. Only the independently wealthy or the completely irrelevant can afford the luxury of infinite free will. With that said, the assignment being a research one, most things looked up were quotes. I didn’t learn anything about or niche or about your role this piece. Since it is about you, it needs more of you in it. You use quotes of other designers to bring up points and then give a service opinion. Dig deeper. Since your main point is about quality of life verse being a hypocrite give me some numbers. Stats may seem boring but when presented well can be compelling. What is the price of your soul? Thanks for the feedback. Not talking about myself was actually done with purpose, as I have been told I talk about my experiences too much and not about design at large enough. I was trying to walk the fine line there. In a rewrite, I’d like to cite a designer about a specific job he didn’t believe in, but a lot of resources tend to be vague with these jobs, as they don’t want to badmouth a company. I don’t like numbers (hence my enrollment in ICM), but I can see your point where it ads more authenticity to the piece. Thanks! Interesting read. I like your choice of topic and I agree with your stance on it. If a job ever made you question your morals I am sure it would be a mistake but designing for something you don’t have a strong interest in or necessarily support challenges your creativity even more. Now you have to think outside of what you normally would to come up with something that will make the client happy. I imagine finding literature on the subject was slightly challenging. This is where an interview or two would come in great, even if it’s from someone who works creatively, not just designers. Thanks Ashley, right on. I did struggle to find quality sources on this, not as many people talk about it as you might think. Some of the work I currently do, I find boring, but there is a challenge to make it interesting that drives me. Great idea with the interview, it was definitely a thought I had after I posted, but perhaps that is an idea for a future post. Thanks for the feedback.